With a moving company and rental vehicle, the general rule is that everything must be packed up entirely on move day and unpacked upon arrival, and the vehicle itself must return to its company that same day or by another set deadline. 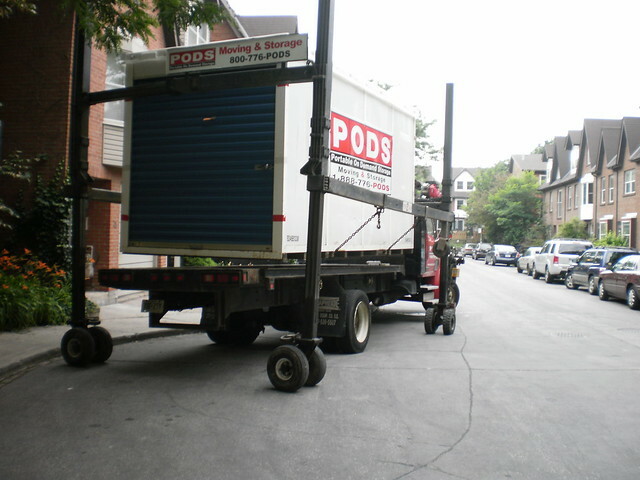 Portable storage units are kept for much longer periods of time, and they have flexible delivery and pick up schedules. This allows people to pack or de-clutter their home at their own pace, as the unit can sit right in their driveway for days or weeks on end. It is also worth mentioning that many companies require that a rented truck or van be returned with the same amount of gas it left with. Since this doesn’t apply to portable storage units, you don’t need to worry about forgetting this small detail which is common way rental companies gouge people’s pocket books. There are different kinds of portable storage units, so you will need to determine what your needs are in order to choose the best one for you. Since size is the primary factor is choosing what kind of unit to get, you need to take a look at how much stuff you are moving, and if you have any large items (pianos, beds, refrigerator, etc.) Because they are lifted on and off of trucks for delivery, pick up and transportation, storage units do have weight limits. If you have a lot of heavy furniture, be sure to ask a company representative about weight limits before you place an order. Standard portable storage units are 8 feet wide, though the specific length can vary. Well-known companies like PODS® and 1800-Pack-Rat® offer 8 x 8 x 12 and 8 x 8 x 16 units. Also worth mentioning is mobile mini®, which, in addition to standard sized units, offers extra wide ones that go up to 25 feet long and 8 feet, 6 inches tall. In addition to these standard sizes, many other companies provide smaller storage options. These are often referred to as “modular” units or containers, and they are typically classified those less than 8 feet units. For example, MyWay® mobile storage is known for its smaller units, which come as 8 x 5 x 7 containers. Of course, you can always get more than one unit, and MyWay is actually one company that will allow you to return a container for a refund if you end up not using it. You should learn about a storage unit company’s security before making a decision. If you will be storing a lot of valuable items, for example, the last thing you want is a unit that can easily be broken into while it’s sitting in your driveway. If your portable storage unit is going to go sit in a storage facility for a period of time after you fill it up (such as when you are not yet ready to move in to your new place but need to clear out your old house), find out what kind of security is there as well. Many companies use secure warehouses, but others may keep them in outdoor areas surrounded only by fences. The good news is that most major brands do provide strong units with locks on them, but be sure to ask about how security features may vary on different sized containers. Always do this before selecting a portable storage unit. You can find previous customer reviews on Yelp, Google Reviews or even Angie’s List if you happen to be a member. Even if you’ve already decided on a company to go with, reading the reviews can help give you a good idea of what sized unit you will want. Because portable storage units can be held for long periods of time, you can actually start packing and/or clearing out your house before you even have a new address to go to. If you’re still looking for that new home, check out RentFinder’s search tool today.